Education majors and non-majors who want experience working with children in a community setting have new opportunities through two AmeriCorps fellowships recently established in honor of the late Aaron Podolefsky, the former president of SUNY Buffalo State. The Center for Excellence in Rural and Urban Education (CEURE) is administering the Dr. Aaron Podolefsky AmeriCorps Student Teaching Fellowship and the Dr. Aaron Podolefsky AmeriCorps Tutoring Fellowship that are funded through generous gifts from Eleanor Woods Beals, ’50, and Vaughn Beals. Applications are now being accepted for the programs that will sponsor up to 30 fellows per year for the next three years. “The Beals wanted to do something in honor of Dr. Podolefsky who had such a commitment to community service and urban education,” said Gina Pannozzo, program director and research coordinator for CEURE. The focus of the program is on children from diverse backgrounds living on the West Side whose first language is not English. 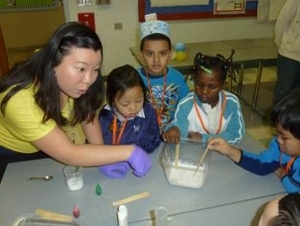 The Dr. Aaron Podolefsky AmeriCorps Student Teaching Fellowship is open to undergraduate and graduate elementary, secondary, and exceptional education majors who will be student teaching in fall 2014. If they are accepted into the program, the students also would complete between 150 and 200 hours of community tutoring K-12 youth this spring. Chosen fellows earn a $2,114 AmeriCorps education award to apply toward tuition, student loans, or other educational expenses. The Dr. Aaron Podolefsky AmeriCorps Tutoring Fellowship is designed for students in good academic standing who are sophomores or higher, are committed to community service, and are willing to commit two consecutive semesters (spring 2014 and fall 2014) to the program. These fellows are awarded a $1,175 to be applied toward educational expenses, including tuition and loan payments. They must complete 150 hours of community service tutoring K-12 youths in the spring and 150 hours in the fall. All participants must concurrently enroll in the undergraduate course Tutoring Students with a Diverse Language Background (English 121) or its graduate equivalent and must be available three hours a day two days per week and on Friday afternoons for program meetings. Additional course requirements include reading and preparing materials for instruction during tutoring sessions. Students may apply at www.buffalostate.edu/ceure or www.buffalostate.edu/cac. For more information, contact CEURE staff assistant Diane Mercuri at mercurde@buffalostate.edu.